Having a good sleep will depend on a number of factors. You should make your room conducive and set the right temperature. It will help if you can also meditate before going to bed or read a book to feel sleepy. You should also use the right pillow. And most importantly, you should have the right mattress. In the case of the latter, memory foam is indeed one of the most popular materials. It is supportive and comfortable, which can help improve your sleep. It is also a good thing that it can provide a custom fit for the user, adding up to the comfort that it can provide. While memory foam is a material that can be beneficial in more ways than one, such will only be the case if it is going to be well-maintained. One of the things that should be done is to keep it clean. How exactly can you clean a memory foam mattress? Keep on reading and we will let you know some of the tips on how this can be possible. Before we discuss the best way to clean the memory foam, it is important to first emphasize the fact that memory foam is a delicate material. It is expensive and fragile. For these reasons, it should be handled with utmost care. Otherwise, its quality and functionality will be compromised. Using the wrong cleaning materials and harsh detergents can break down the main material. In addition, if you scrub it too hard, the surface will also be prone to damages. Another important thing to keep in mind is the fact that this type of foam does not like liquids. Because of its overall construction, you should use as little amount of liquid as possible. Liquid can collect on the several layers of the foam. In turn, this can be a breeding ground for bacteria and this can also cause the foam to sag in the long run. The first thing that you have to do is to take it out of the bed. It would be best to have it cleaned in an area that is spacious, and more importantly, where there is sufficient air. Make sure that there is enough room for you to move around, making it easier to accomplish the cleaning task. It will also be good to place a layer of tarp on the floor so that there will be some sort of protection. Start with vacuuming the surface, which will effectively remove dirt and dust. When vacuuming, do it in circular directions. Make sure that the entire area is going to be covered. If there are small gaps, make sure that they will also be vacuumed. Once you are done vacuuming, proceed to spot cleaning. This should be done on specific areas that are stained. Dip a cloth in mild laundry detergent. Have it dabbed on the specific areas of the memory foam mattress that has stains. Make sure to take a look at the ingredients used in the detergent. It must be free from harsh ingredients, such as ammonia and bleach. Have a spray bottle filled with mild detergent and warm water. Spray it on the mattress until the whole surface is already covered. Make sure to spray only minimal amount of liquid. Avoid having the memory foam soaked. Allow the spray to stay on the surface for at least an hour. To remove the detergent from the surface, use a clean and dry cloth. Press it on the surface of the mattress. Do this until you finish the entire mattress and once it is completely dry. Flip the mattress and apply the solution again and pat it dry. To finish cleaning your memory foam mattress, have it air dried. You can have it dried in the patio or in a room with sufficient ventilation. You have to make sure that it is completely dried before being used. Otherwise, there is a possibility of having musty odor, which can be disruptive for your sleep. 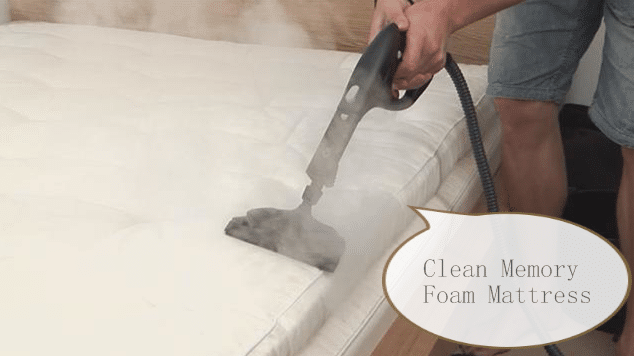 In sum, cleaning your memory foam mattress does not need to be a hard task. You do not have to pay someone to do it. You can do it on your own. You will need basic materials and the best thing is that it will be almost effortless on your end. Just refer to the steps mentioned above. To improve the quality of your sleep, one of the most important things would be the use of the right pillow. They vary in terms of their size, shape, and the materials that are used. In the case of the latter, memory foam is indeed one of the most popular. It is preferred by many because it can be beneficial in more ways than one, specifically in being able to provide customized fit to the user. With such, you can be confident that it will be able to improve your sleep. While it is nice to have a memory foam pillow, it is important to exert effort in having it well-maintained. It should be seen as an investment, and hence, you should do what it takes to keep the pillow in its best condition, even with prolonged use. Washing is one of the ways to keep it clean. However, it should not be washed by having it soaked in water as it can damage its overall quality. Keep on reading and we will provide you with tips on how this can be done. Washing is important because it is going to keep your pillow clean and crisp. Through time, pillow can accumulate dirt and can be a breeding ground for bacteria. Odor can also be a major problem. It can stink if you do not have it cleaned regularly. Dust can also be present, and hence, can be a cause of allergies. With all of these things, you definitely have a good reason to have it washed regularly depending on the instructions from the manufacturer. When washing memory foam pillows, one of the most important things to remember is to not have it soaked in water for an extended period. Memory foam should be kept dry and if you use more liquid in having it washed, it can lead into sagging. This can also make the pillow a breeding ground for bacteria, which is surely one thing that you won’t like to happen. You should also keep in mind that memory foam is a delicate material. Traditional detergents can have strong and harsh ingredients. They can cause damage on the surface add can make it look worse instead of having it cleaned. Make sure to refer to the list of the ingredients used in the detergent and see to it that they are mild. Throwing the memory foam pillow in the washing machine and dryer is one thing that you should avoid at all costs. Remember, it has a delicate composition and exposure to water can lead into accumulation of liquid that can trigger growth of bacteria. 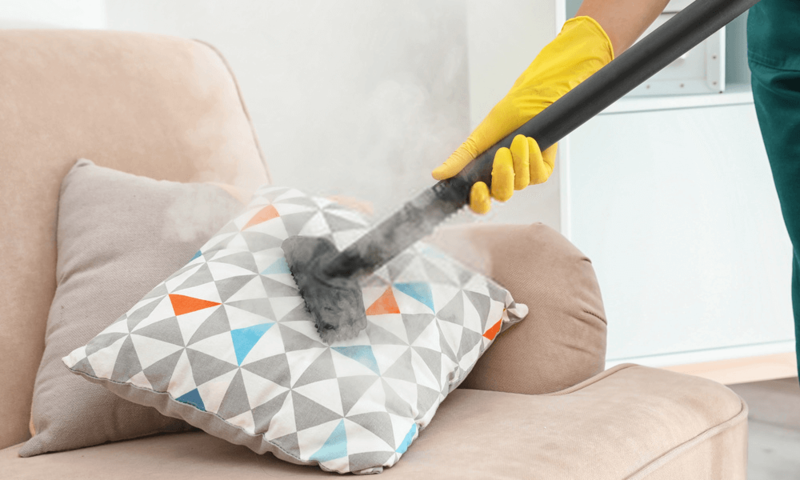 To have the pillow cleaned, first, you need to have the surface vacuumed. Use an upholstery attachment or a handheld vacuum to do this. Using a vacuum with a HEPA filter is also highly-recommended as it can take out even the tiniest dirt. After vacuuming, prepare your cleaning solution. Combine one part fabric cleaner and two parts of warm water. Shake the mixture and have it sprayed on the entire pillow. Make sure to keep the spray minimal so as not to soak the pillow. Let the mixture sit for about half an hour. Using a clean cloth, blot the entire pillow. This is going to absorb any liquid that is left on the surface. Keep on blotting until there is no evident wet spot. Next, have a spray bottle filled with water. Take note that by this time, the spray bottle should contain only water and should not be mixed with cleaning agent. Have it sprayed on the entire pillow and blot just like what you did earlier. Repeat this at least twice, or until you are sure that no cleaner is retained on the pillow. Use a hair dryer, in its cool or lowest setting, to dry the pillow. Make sure that it is completely dried before having it used. You can also have it dried under the scorching heat of the sun. Again, remember that this should never be be put in a dryer. This can cause wrinkling and deformation, among other structural problems.